India at Q uses their own specialised couriers to deliver their food. 2 x Samosa, 1 x Butter Chicken, 1 x Lamb Rogan Josh, 1 x Saffron Rice, 2 x Naan, 1 x Raita 1 x Chutney, and 4 x Tandoori Papadums. 4 x Samosa, 4 x Lamb Seekh Kebab, 1 x Butter Chicken, 1 x Lamb Rogan Josh, 1 x Mixed Vegetable Curry, 2 x Saffron Rice, 2 x Naan, 1 x Raita, 1 x Chutney and 4 x Tandoori Papadums. Pyramid shaped pastry filled with lightly spiced potatoes and peas. Spinach, potato and onion fritters. Onion fritters made with a lentil batter. Fresh mushrooms marinated in traditional yoghurt based sauce. Chicken overnight marinated in garlic, ginger and traditional dry spices cooked in tandoor oven and served with seasonal fresh salad. Boneless pieces of chicken marinated with tandoori masala cooked in the tandoor. Lamb mince with coriander, cumin, chillies spices, rolled in skewer and cooked in Tandoor. Onion, capsicum, tomato, paneer ricotta cheese cooked in the tandoor. Lightly spiced and marinated rockling fish. Prawns marinated in spices and herbs and cooked in tandoor. Lamb Cutlets, Seekh Kebab, Chicken Malai Kebab, Tandoori Chicken and Chicken Tikka. All curries are gluten free. Chicken tikka cooked in tomato and cream sauce. Home style chicken curry cooked in a traditional sauce. Pan-fried with chilli, ginger, onion and capsicum. Chicken tikka cobbed with onion, tomato, capsicum, ginger and spices. Cooked in chilli vinegar sauce. Coconut based curry, South Indian delight. Garlic flake sauteed in vegetable oil with spinach and blended with traditional spices of India. 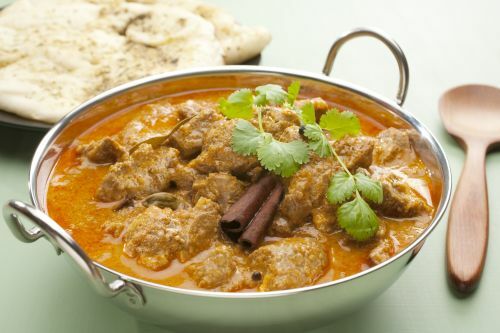 Mildly spiced lamb pieces cooked in a cashew nut paste. Whole chicken cooked in tandoor (BBQ) with bones cut into pieces and cooked with sauteed of traditional Indian spices. Diced lamb cooked in onion gravy. Lamb mince with ginger, green chillies, fresh coriander, onion and mild spice rolled on skewer cooked in the tandoor. Beef cooked with chillies, onion, tomato, ginger, mustard seeds and curry leaves. Beef cooked with fresh mushrooms. Simmered with tomatoes, capsicum and eggplant . Coconut based south Indian coastal specialty . Spicy mint yoghurt base with green chilli. Pieces of rockling fish fillet cooked in a mild almond sauce finished with cream. Prawn cooked in mild coconut sauce. Cottage cheese cooked in spinach puree. Potato cooked with onions, tomatoes and garlic. Veggies cooked with herbs and spices. Pumpkin gently cooked in vegetable gravy. Cottage cheese, fresh mushroom and peas curry. Potato and peas cooked in onion and tomato sauce. Lentils soaked overnight and simmered with herbs. Lentils cooked with red kidney beans, butter and cream. Cauliflower and potato cooked with Indian spices. Potato cooked in spinach based sauce. Mushroom and peas cooked in lightly spiced sauce. Cheese and potato balls prepared in creamy sauce. Eggplant and potatoes cooked in onion sauce. Smashed eggplant with onion, tomato ginger saute mild to medium spice. Whole meal bread cook in tandoor. Naan stuffed with spicy lamb mince. Naan stuffed with cottage cheese and coriander. Naan filled with fruits and nuts. Whole meal bread stuffed with potatoes and herbs. Fresh coriander, chilli and potato. Coconut, mustard seeds and curry leaves. Mixed vegetables cooked with rice, mint and spices. Rice cooked and flavoured with a variety of spices and garnished with coriander leaves. Tandoor baked crispy thin lentil crackers. Cucumber and carrot in yoghurt and spices. Indian salad with lemon dressing. Dumplings lightly fried and soaked in clove and cardamon syrup.